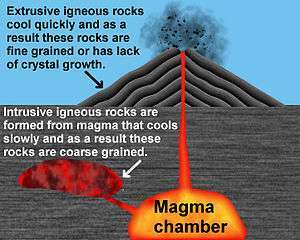 Igneous rock (derived from the Latin word ignis meaning fire), or magmatic rock, is one of the three main rock types, the others being sedimentary and metamorphic. Igneous rock is formed through the cooling and solidification of magma or lava. 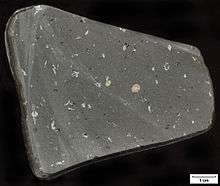 The magma can be derived from partial melts of existing rocks in either a planet's mantle or crust. Typically, the melting is caused by one or more of three processes: an increase in temperature, a decrease in pressure, or a change in composition. Solidification into rock occurs either below the surface as intrusive rocks or on the surface as extrusive rocks. Igneous rock may form with crystallization to form granular, crystalline rocks, or without crystallization to form natural glasses. 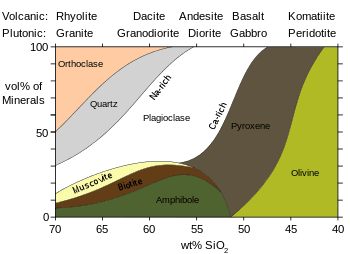 Igneous and metamorphic rocks make up 90–95% of the top 16 km of the Earth's crust by volume. Igneous rocks form about 15% of the Earth's current land surface. 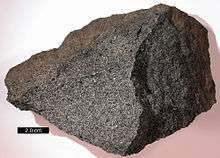 Intrusive igneous rocks are formed from magma that cools and solidifies within the crust of a planet, surrounded by pre-existing rock (called country rock); the magma cools slowly and, as a result, these rocks are coarse-grained. 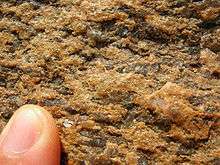 The mineral grains in such rocks can generally be identified with the naked eye. 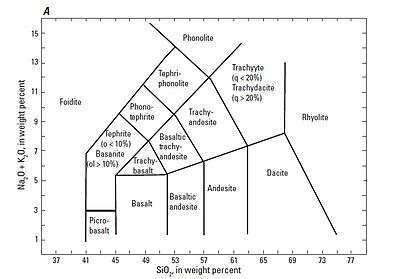 Intrusive rocks can also be classified according to the shape and size of the intrusive body and its relation to the other formations into which it intrudes. Typical intrusive formations are batholiths, stocks, laccoliths, sills and dikes. When the magma solidifies within the earth's crust, it cools slowly forming coarse textured rocks, such as granite, gabbro, or diorite. Gabbro specimen showing phaneritic texture; Rock Creek Canyon, eastern Sierra Nevada, California; scale bar is 2.0 cm. ↑ Prothero, Donald R.; Schwab, Fred (2004). Sedimentary geology : an introduction to sedimentary rocks and stratigraphy (2nd ed.). New York: Freeman. p. 12. ISBN 978-0-7167-3905-0. ↑ Wilkinson, Bruce H.; McElroy, Brandon J.; Kesler, Stephen E.; Peters, Shanan E.; Rothman, Edward D. (2008). 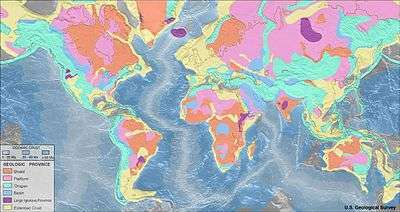 "Global geologic maps are tectonic speedometers—Rates of rock cycling from area-age frequencies". Geological Society of America Bulletin. 121: 760–779. doi:10.1130/B26457.1. ↑ One or more of the preceding sentences incorporates text from a publication now in the public domain: Chisholm, Hugh, ed. (1911). "Petrology". Encyclopædia Britannica. 21 (11th ed.). Cambridge University Press. pp. 323–333.